The salt water beaches on the Cape are quite popular, from the Outer Cape, to the Lower Cape, to the Mid Cape, to the Upper Cape. While the salt water offers plenty of enjoyment, some days it can be nice to relax at a pond. The freshwater beaches of Cape Cod are quite enjoyable, and they are great for families with young children, as there are no intense waves or undertows. Here are some of the best freshwater beaches on Cape Cod. Gull Pond, Wellfleet. Located off School House Hill Road in Wellfleet is Gull Pond, a nice place to cool down, surrounded by pine trees. Kayaks and canoes are welcome, and there is also a dock in the water. The beach is small and parking is limited, so get there early. To park, you need a Wellfleet beach sticker. Great Pond, Wellfleet. Located right off of Cahoon Hollow Road in Wellfleet is Great Pond, which boasts clear warm water and a shady beach. While this beach is not great for those wishing to get a tan, families will children will delight in this secluded slice of Wellfleet. The beach area is small, so keep that in mind. To park, you need a Wellfleet beach sticker. Great Pond, Eastham. This pond actually has two access points, one from Wiley Park off of Herring Brook Road and the other off of Great Pond Road. Beach stickers are required to park at either beach, but Wiley Park has an attendant who sells passes. Pilgrim Lake, Orleans. Located off of Herringbrook Road in Orleans (which is off of Monument Road), Pilgrim Lake is great for swimming and fishing. A beach sticker is required to park. Crystal Lake, Orleans. Another one of the great ponds in Orleans is Crystal Lake, located off of Monument Road. Although the beach is not too big, it is nice and there are shady areas. Right across the street is Kent’s Point, so this can be a nice stop after a walk. A beach sticker is required to park. Baker Pond, Orleans. This pond, located off of Baker Pond Road in Orleans, has a small beach and parking area, but it quite nice for a dip, especially if you have children in tow. Nickerson Ponds, Brewster. Nickerson State Park has many kettle ponds across its sprawling acreage, and access to the park used to be free, but there is now a daily fee to enter the park by car. Sheep Pond, Brewster. This lovely pond has a public landing off of Route 124 in Brewster, and it is great for swimming and fishing. Kayakers and canoeists can explore the great pond, and there are small landings along the way that are great for taking a quick dip. If you boat to the other side, there is even a floating dock. A sticker is required to park. Seymour Pond, Brewster/Harwich. Seymour Pond has a public landing that is accessible by car, but it is also accessible by a trail in the Punkhorn Parklands. Parking is free there, so those who don’t want to spend the money on a beach sticker may consider stretching their legs a bit. Long Pond, Brewster/Harwich. Popular for boating, as well as swimming, Long Pond has access in Brewster off of Crowell’s Bog Road (sticker required) and off of Long Pond Drive in Harwich (sticker required). Upper Mill Pond, Brewster. With a landing off Run Hill Road (near the entrance to the Punkhorn Parklands), Upper Mill Pond can be a nice place to spend a day. A sticker is required to park. Hawknest Pond, Harwich. Located right in the thick of Hawksnest State Park is Hawksnest Pond. To get there, turn onto Spruce Road off of Route 137 and you will then see Hawksnest Road. The road goes through the park. Goose Pond, Chatham. To get to Goose Pond, watch for the conservation land sign and the small dirt road off of Queen Anne Road in Chatham. The road is a bit rough, so be prepared. There is limited parking, but the parking area hardly ever feels full because of the general seclusion of this spot. This is a great spot to go for a swim and spend an afternoon. 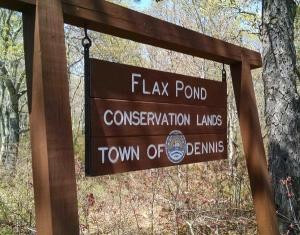 Flax Pond, Dennis. This pond has a parking area located off of Setucket Road in Dennis, right before the Yarmouth line. There is no sticker needed and the area is dog-friendly. There is even a rope swing! To get to the pond, you will need to walk (about 5 minutes) and there are trails around the pond, so you can go for a walk and cool off with a dip. Scargo Lake, Dennis. This swimming spot is absolutely beautiful. Princess Beach is the primary swimming area. Princess Beach is located off of Scargo Hill Road (which is off of Old Bass River Road). To park, you need a sticker, although there is an attendant who collects the parking fee. Sandy Pond, Yarmouth. Located at 482 Buck Island Road in Yarmouth, across from the Park Department, is the Sandy Pond Recreation Area. Not only is there swimming, but there is also a playground, tennis courts, a basketball court, and more. None of the ponds require a sticker in Yarmouth. Long Pond, Yarmouth. Located 123 Indian Memorial Drive in South Yarmouth, is the Long Pond Recreation area. Just like Sandy Pond, there is a beach, as well as a playground, a basketball court, and a wooded area. Hathaway’s Pond, Barnstable. This pond is located off of Phinney’s Lane in Barnstable. A beach sticker is required. In addition to the beach and roped off swimming area, there is a playground and swing set, as well as barbeque grills and picnic tables, so this is a great spot for a nice calm day at the beach. Lake Wequaquet, Barnstable. Located off of Shootingfly Hill Road in Barnstable, Lake Wequaquet offers a lovely little beach that is also handicapped accessible, with a ramp on the beach. The swimming area is roped off and kayakers and canoeists can also enjoy the waters. A beach sticker is required. Wakeby Pond/Mashpee Pond, Sandwich/Mashpee. This pond complex offers some of the best swimming on the Upper Cape. A sticker is required to park, whether you are on the Sandwich side or the Mashpee side. The Wakeby (Sandwich) side is located off of South Sandwich Road, while the Mashpee Pond side is located to the north of Route 130, just after the intersection with Great Neck Road. John’s Pond, Mashpee. Located off of Hooppole Road in Mashpee is John’s Pond, which is a nice spot for swimming and boating. Snake Pond, Sandwich. To get to Snake Pond, follow Route 130 to Snake Pond Road. This pond is very nice for swimming in, as well as kayaking and canoeing. A beach sticker is required to park. Grews Pond, Falmouth. Located in Goodwill Park – off of Route 28 – in Falmouth, Grews Pond is a very nice spot to go for a dip. No sticker is required. There is a lifeguard on duty in summer. There is also an area to play volleyball and barbeque grills, which makes this a wonderful spot to spend the day and have a picnic. Flax Pond in Dennis is one of many wonderful Cape Cod freshwater ponds on town conservation land. Maggie Kulbokas photo.